The Least Tern (Sternula antillarum, formerly Sterna antillarum) is a species of tern that breeds in North America and in northern South America. 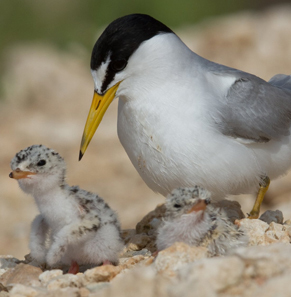 The western population, the California Least Tern, is federally and state listed as an endangered species and is also a State of California fully protected species. This bird was first listed in 1972 with a population of about 600 pairs. With some very aggressive management, the California population has rebounded in recent years to about 4,500 pairs, a marked increase from 582 pairs in 1974 when census work began, though it is still listed as an endangered species. The California species breeds on beaches and bays of the Pacific Ocean within a very limited range of southern California, in San Francisco Bay and in northwestern Mexico. While numbers have gradually increased with its protected status, it is still vulnerable to predators, natural disasters and further disturbance by humans. There is an excellent opportunity to observe these birds at the Least Tern Preserve, a part of Huntington State Beach, located at the Santa Ana River mouth next to the north jetty. Even though the preserve is in very close proximity to the Newport Banning Ranch property, the EIR barely mentions the species except to say that the current oil operation is so disruptive that they do not believe the California Least Tern would ever be found on or near the property. The Least Tern arrives at its breeding grounds in late April. The breeding colonies are not dense and may appear along either marine or estuarine shores, or on sandbar islands in large rivers, in areas free from humans or predators. Courtship typically takes place removed from the nesting colony site, usually on an exposed tidal flat or beach. Only after courtship has confirmed mate selection does nesting begin by mid-May and is usually complete by mid-June. Nests are situated on barren to sparsely vegetated places near water, normally on sandy or gravelly substrates. In the southeastern United States, many breeding sites are on white gravel rooftops In the San Francisco Bay region, breeding typically takes place on abandoned salt flats. Where the surface is hard, this species may use an artificial indentation (such as a deep dried footprint) to form the nest basin. The Least Tern hunts primarily in shallow estuaries and lagoons, where smaller fishes are abundant. It hovers until spotting prey, and then plunges into the water without full submersion to extract its meal. In bays and lagoons of Southern California and northern Mexico, the favored prey include anchovy, smelt, silversides, shiner surfperch and small crustaceans. Sometimes the terns feed near shore in the open ocean, especially in proximity to lagoons or bay mouths. Adults do not require cover, so they commonly roost on the open ground, but after young chicks are three days old, they are brooded less frequently by parents and require wind blocks and shade. Notable disruption of colonies can occur from predation by Burrowing Owls, American Kestrels, Coyotes, Bobcats, Great Blue Herons, and Kites.